Wear your heart on your sleeve and if your heart is set on being a great angler do not shy away from declaring just that! Get some help in doing so with the help of this gorgeous antique styled sign board printed on wood that plays around with words to get the message starkly though-you would love to tackle this one job! 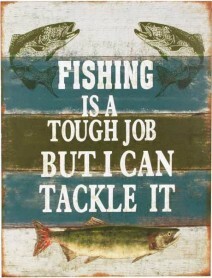 Be the first to review “Tough Job Fishing Sign” Click here to cancel reply.